I am so over Twilight and Edward! 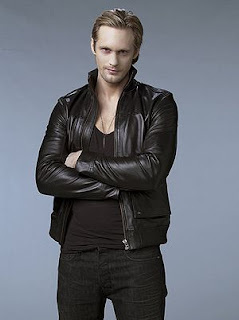 I am now so addicted to the Sookie Stackhouse Novels and of course Eric Northman! I got interested in the Sookie Stackhouse novels or the Southern Vampire Mysteries because of the HBO series "True Blood". I did not like "True Blood". I found it boring even though they made it very gore. The novels are a big revelation! The writing is sharp, funny, and witty and the stories are fast paced and action packed. Charlaine Harris' characters are interesting and endearing. The novels are truly addictive! I am now one of a few million people people wanting to know what will happen to Sookie and Eric. Obviously, I am an Eric fan! The talent of Ms Harris lies in making readers curious, she is a mystery writer after all. Not that she is not a good romance writer, when you think about it, the Sookie and Eric thing is just a side dish in the novels' plot lines but I don't think anyone who have read this series could take it for granted or forget about the shower scene in "Dead to the World "(book 4, hayyyyyy) and the witty exchanges between Sookie and Eric. Priceless! The fact is, after reading 9 books, I am still on pins and needles about book 10! I just can't wait to sink my fangs into it! My only fear about this series is that Charlaine Harris will drag the series on until it gets boring. She will release book 10 in May and apparently there will be 3 more after that. Seriously, I don't know if I can wait that long to find out if Sookie and Eric will be together or if I can handle it if they don't get together! The problem is with 14 books to follow (released every year, so 14 years! ), there's a lot of time and emotional involvement on the readers part not to get a satisfying ending. Unfortunately for me, there is only 1 way to satisfy me.